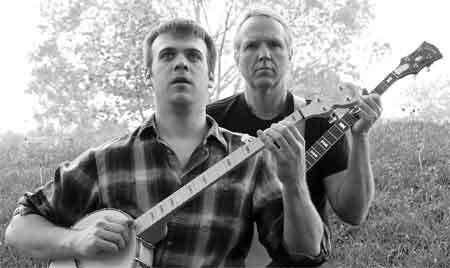 The Ballad of Weedy Peetstraw – playing at Theatre Passe Muraille as part of SummerWorks – is a bluegrass opera by Peter Anderson and John Millard. As the show opened there were 4 people on stage and the theatre was filled with beautiful singing. I assumed that it was recorded because, even though it had the feeling of live singing, the sound was so big I couldn’t imagine that there were enough people left in the cast to make it. There were. They arrived on stage carrying a coffin and singing. I was hooked. The Ballad of Weedy Peetstraw is a Faustian story of a young man who sells his soul to the devil in return for the freedom to play his banjo. I really don’t know where to start . Some of the people involved in this production were involved in the original production in 1999. This is a mature, experienced cast and production team delivering a fresh take on an older show. It was 90 minutes of joy. The music was wonderful and the musicians (Rebecca Bruton – fiddle, Rob Clutton – string bass, Jim Millard – banjo, Tim Posgate – acoustic guitar) were on the stage through the show. There wasn’t much in the way of a set, a coffin, a door frame, and a chair. Glenn Davidson’s lighting set the mood and defined the space. The show is set in an undefined time in a rural area. It felt as if it was the fifties – or maybe earlier. At first the costumes (Emily Smit-Dicks) seemed quite neutral but as I think about it they helped define the characters. Scratch (John Millard) in his long black coat and black hat looked like someone to avoid. Hazel Peetstraw (Nicola Robert) looked every inch the farm wife and mother. Jeeva (Courtney Ch’ng-Lancaster) could only have been the good girl, the girl he left behind. My favourite was the Hellhound’s (Randi Helmers) costume; best ever use of an old fur coat. I thought that the entire show was wonderful but there were some stand-out moments – Reverend Jacob Ladder’s (Greg Campbell) hell-fire and brimstone eulogy; Weedy Peetstraw’s (Jamie Mac) dancing and air banjo playing when he was Bugle Boy; Jeeva singing ‘Give Me That Boy’; Weedy and Scratch’s banjo duel. Show times: Thursday August 8, 6:30 pm; Friday August 9, 9:00 pm; Saturday August 10, 1:30 pm; Tuesday August 13, 9:00 pm; Wednesday August 14, 4:00 pm; Thursday August 15, 6:30 pm; Saturday August 17, 4:00 pm.